The Legal Affairs Committee (JURI) votes on “Proposal for a recommendation on subsidiarity on the proposal for a Directive of the European Parliament and of the Council amending Council Directive 91/477/EEC on control of the acquisition and possession of weapons” on 24 May. See point 24 in this link. Update: Vote has been postponed. Because most National Parliaments failed to reject the Proposal regarding subsidarity our hope lies now in JURI and the European Parliament. Only Poland and Sweden made a complaint in time. Please inform the members of JURI, especially the ones of your own nation about this vote. This means that EU has to tackle cross-border movements of firearms but not the internal security of the Member States (MS). If either a majority of governments or MEPs agrees that the orange card is justified, then the legislation is defeated outright. 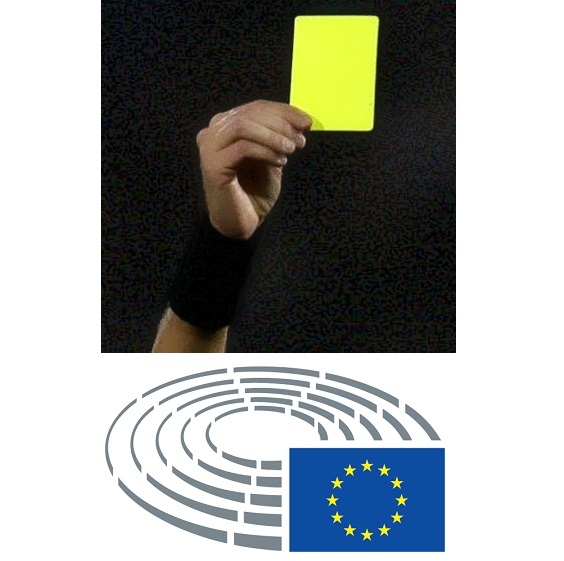 Read more: THE EU’S ‘YELLOW CARD’ COMES OF AGE: SUBSIDIARITY UNBOUND? What looks democratical is in reality only a show. National parliaments have yellow-carded new legislation only twice and never played the orange card in the past. Because Commission skipped the four-week-consultation with stakeholders before publishing Proposal and also misused the Christmas-holliday-break only a few National Parliaments made their complaints in time of the eight weeks. Only two National Parliaments hit the topic of subsidarity in time. To sum up, the Riksdag takes the view that the proposal for a directive generally complies with the subsidiarity principle, but that there are a number of areas in which it does not. Chief among these are the rules on limited-duration licences and mandatory medical tests in the authorisation procedure. The Riksdag takes the view that these measures go beyond what is necessary to achieve the objective of the proposal. In the Riksdag’s opinion, that objective can be achieved just as well if the directive gives the Member States more scope to determine for themselves the measures to be taken. the Commission has not conducted an assessment of the impact that the introduction of the new rules will have. Further restricted legal access to firearms and the legal possession of arms including the requirements for secure storage and the implementation of an EU-wide, coherent approval concept relate to in core the questions of public security. According to Article 3 paragraph 2 EUV and Article 67 paragraph 1 AEUV the EU offers its citizens a true space of freedom, security and justice. [..] A broad interpretation of these provisions is ruled out, however the maintenance of public security and order and the safeguarding of internal security are responsibilities of the Member States. (Article 72 AEUV) and remain in their sole responsibility (Article 4, paragraph 2, sentence 3 EUV). The EU does not have a regulatory authority by the harmonization powers or coordinating powers laid down in Article 114 AEUV, which relates to the installation and functioning of the internal market. For the creation of a largely unified substantive weapons legislation at European level Article 114 AEUV does not constitute an adequate legal basis. Unlike the primary trade-related matters of firearms policy and the contract’s conclusion of the UNFP this proposal regarding the legal access to and possession of firearms does not in general relate to cross-border situations. With this background concerns remain against a legislative proposal by the Commission regarding the maintenance of the subsidiarity principle (Article 5 paragraph 3 EUV) and the principle of proportionality (Article 5 paragraph 4 EUV). You may also note that Proposal violates its own REFIT rules. First, stakeholders will be able to express their views over the entire lifecycle of a policy.“Roadmaps” and “inception impact assessments” will give stakeholders the chance to provide feedback and prompt them for relevant information, right from the very start of work on a new initiative. Our stakeholders made inquiries in Brussels. Fabio Marini, head of Task Force Firearms in the Commission (DG Home), denied these rumors. “There were no plans for it, only for deactivated firearms”, he said. And then DG GROW presented the Proposal with drastic bans and drastic restrictions which are a threat to national and individual security and the Guideline for deactivated firearms. The latter one is so unpractical that IMCO wants to rewrite it. Read more about the history of Commissions anti-gun action in our report. Cynically using the Paris November attacks as a pretext for urgent action in “combating terrorism”, the Commission did away with the stakeholder’s consultation that usually takes four weeks. It used the same excuse to avoid calling for an impact assessment. The three studies of the European Union to which Commission refers recommends three legislative guidelines for marking, deactivation and alarm weapons. All the loopholes identified in the Evaluation could have been tackled effectively with these guidelines, one of which was implemented in November 2015. However the studies did not include any mention of, let alone an impact assessment on confiscation of legally-owned private property, irreversible damage to historical artifacts, stricter rules for legal access or the prohibition of distance sales. The Commission expects to override Member States’ discretion in the licensing of law abiding citizens which they have no cause to distrust. For further information you may read our “Answers to IMCO” and our “Answer to the Council” regarding proposal. Also EESC which should – regarding to EC – present a bridge between citizens and Commission ignored totally our point of view. European Commission even lied regarding involvement of stakeholders. European Commission does not publish our Feedback on Proposal. This consultation was closed in the end of January. Subject: Firearms Directive: compensation for destroyed firearms and toys of 12th of January answered on 26th of April without details but imprecise phrases. We recommend to contact your national Member of Parliament of the JURI Committee in your own language with a short and polite email or letter. FIREARMS UNITED represents authorised firearms owners in nearly all Member States, together with our “national chapters” or partners. Some of the latter are listed in the Transparency Register of the EU. We also initiated a petition against this proposal with more than 320.000 signatures.